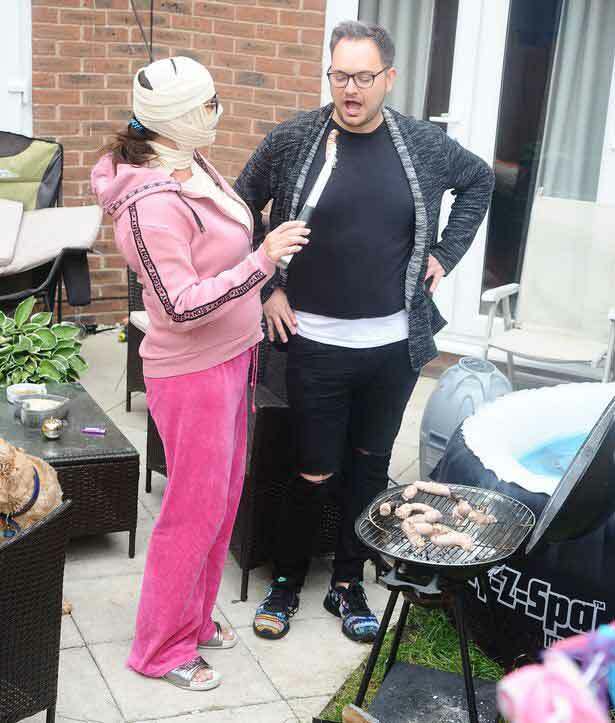 Lisa Appleton has been spotted with her head and chest completely wrapped in bandages after having more than £10,000 worth of cosmetic surgery. The former Big Brother star didn't let it spoil her summer fun, though. She's seen for the first time in Mirror Online's exclusive pictures enjoying a barbecue in the garden with an unknown male friend. 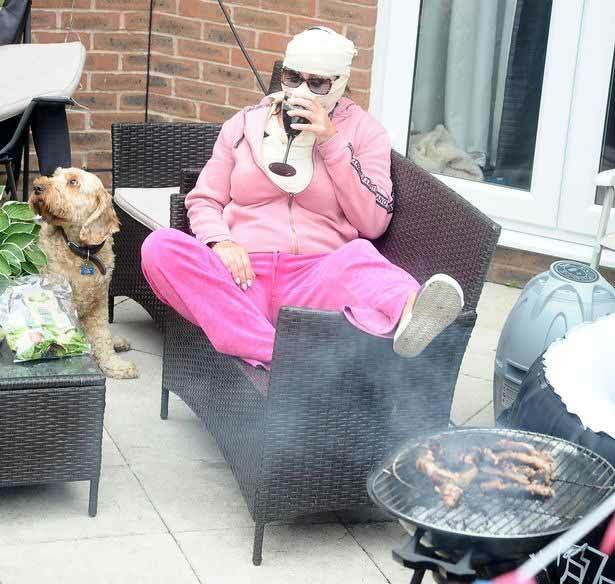 The 49-year-old can be seen cooking some sausages on the grill as she relaxes with her pal and her dog. 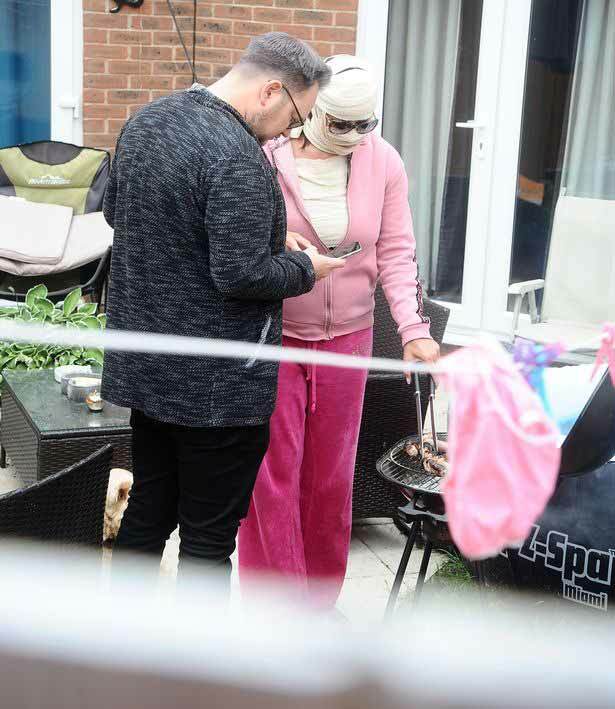 Lisa was wearing a pair of pink sweat pants, a hoodie and sunglasses while she had some me time in the garden following her operations, which were done by cosmetic surgeon Mr Ian Morgan at Soul Care Aesthetics, in Cannock. While it's not known exactly what procedures she's had done, Lisa's chest and face were completely wrapped in bandages. 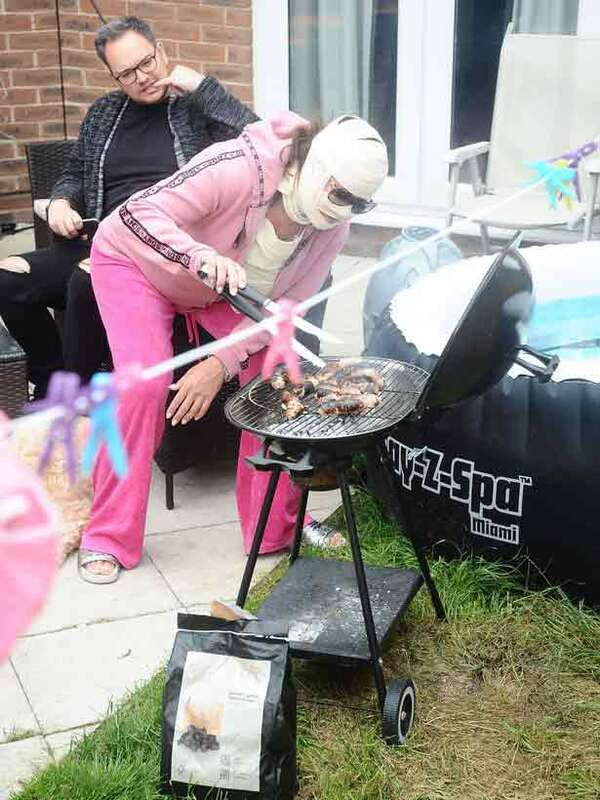 Lisa was also seen tucking into a bag of salad as she waited for her sausages to cook, and appears to have been planning a bit of a spa day as there was an inflatable hot tub filled and ready to go. Lisa was also seen enjoying a glass of wine and posing for selfies as she stretched out on the patio furniture and put her feet up. As her sausages cooked away, a solitary pair of pink knickers were seen hanging on the clothes line above the barbecue, probably meaning they'll be no good to wear before another go through the washer. As her male friend arrived, he presented Lisa with a bottle of wine, that she was clearly happy to receive. It is not known what their relationship is, but he did appear to have a sneaky glance at Lisa's bum as she bent over to check on her sausages. And in one bizarre picture, she's seen holding up a hammer, but it's not entirely sure what she's planning to do with it. Lisa appeared briefly on Big Brother's Bit On The Side tonight. She was among a host of stars who congratulated host Rylan Clark-Neal on his 300th episode. Covered in bandages, she sent a sweet message to Rylan. Mirror Online has contacted Lisa's representatives for comment.